It was a night like any other night. Or was it? The evening sky glittered with tiny specks of light. Nighttime sounds are heard along with the baying of animals. Suddenly the darkness filled with the sounds of screams, first of a woman, then of a baby. After 400 years God broke His silence. On this night God who was incapable of being seen could now be seen and touched in the form of a babe. On this night there was a shift. The world changed with a cry of a baby and not just any baby but the fulfillment of the promise of the Messiah. Did the great deceiver feel it? As the babe cried, did he also cry in agony? Did he sense his impending doom? Did he get a headache, feeling as though his skull was being crushed? Did he remember the curse placed upon him thousands of years before? It didn’t take long to know something huge happened in the heavens. With the shout of the angels and the host of heaven singing it would be hard to miss. I imagine the great deceiver frantic trying to figure out just what happened and how he missed this day. The great mystery began with the cry of an infant. One day this babe would sacrifice himself so he could live in us. No longer to visit and leave, no longer for a chosen few. For anyone who wanted they now could be inhabited by the creator of the universe. We would become the dwelling place of the Most High. 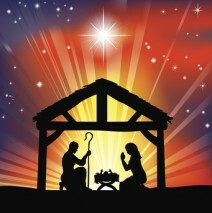 All because of a babe wrapped in strips of cloth and lying in a manger. All the authority, power and glory of God wrapped into a sweet bundle of joy who needed to be fed, changed and cuddled. Mary carried the glory of God for nine months and now she held him in her arms. She watched and listened when the shepherds came with their encounter with heaven. She hid every word in her heart. Any time she wanted she would remember every detail right down to the smell. Now we too can carry the glory and have our own encounter with heaven. I’m in awe of all that Jesus endured to bring heaven to earth. After the sounds of Christmas fade and you sit in the quiet, take a moment to ponder how heaven came to earth in the form of a babe and made the invisible seen. Karen DeArmond-Gardner: Wife to Tom Gardner. Mother to Amanda and Jonathan. Nana to Tyler, Jared, Noah and Lauryn. Employed in the Health Insurance industry by day, writer by night. Co-founder of My Purpose Now.